Over the ages, in both the East and the West, artists have sought out ways to express the illusion of movement or stillness. Even in the most immobile of presentations like paintings and sculptures, we can feel a sense of dynamism and speed, or conversely, a feeling of “stillness” heightened by that very same immobility. 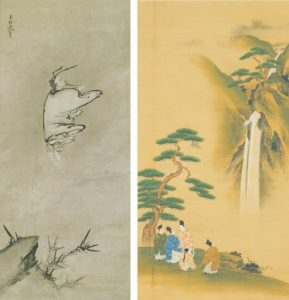 This show examines the masterful use of brush, compostion and negative space to express the two qualities of dynamism and stillness through selected works of traditional Japanese art from the Hara Rokuro Collection. A variety of perspectives are included, from painterly representations of landscape, human figures and animals to the flowing, expressive line of the calligrapher’s brush. Lie Zi was a master of the supernatural arts who could control the wind with his will. He is shown floating in the sky with an ecstatic expression on his face. Lie Zi’s beard, clothing and bamboo leaves flow upward and to the right to convey the dynamism of the blowing wind. This feeling of energy is further emphasized by the unique shape of the sleeves and hem of the robe filled with wind. In this scene from Ise Monogatari (Tales of Ise), the central subject is composing a poem standing before Nunobiki Falls. The hair is expressed by fine overlapping ink lines, while the pattern on the nobleman’s clothing is finely delineated with colors mixed with gold pigment. The falls are captured with faint sumi ink and white paint, down to the water spray. Every part of the image is meticulously depicted, from the people to the landscape, with light brushstrokes. These paintings show a scene at the water’s edge where geese play, wagtails rest on rocks and a pair of turtle doves sit on the branch of a large pine tree. The scene is depicted with a soft touch. Water fowl symbolize prosperity and happiness, while turtle doves symbolize marital harmony and fertility. The dove is also a symbol of peace. A strong wind blows in from the ocean and ominous clouds fill the sky as the samurai Minamoto no Tametomo looks out towards a distant boat. His firm stance against the threat of foreign forces seems to suggest the spirit of the forces loyal the Tokugawa shogunate during its final days. The artist Kikuchi Yo’sai (1788-1878) was noted for his work depicting famous historical figures. This work pictures the famed archer Tametomo. The work is noted also for the inscription by the famous statesman Katsu Kaishu whose career spanned the late Tokugawa and early Meiji periods. The Kankai Pavilion was built in 2008 as part of an expansion of the Hara Museum’s annex, Hara Museum ARC, that took place to mark the 20th anniversary of its founding in 1988. Its purpose is to provide a showcase for the Hara Rokuro Collection of traditional East Asian art. At present, about 120 works comprise the collection, including a number of works designated National Treasure or Important Cultural Property. The design of the Kankai Pavilion (by Arata Isozaki who also designed Hara Museum ARC) incorporates features of the Japanese shoin (drawing room). It thus offers the viewer a new spatial experience that lies at the intersection between the traditional and the modern. Closed: Thursdays (except during the month of August) *Subject to temporary closure in the event of severe weather. *Visitors to the Kankai Pavilion can view the on-going exhibition in the contemporary art galleries as well. *For residents of Gunma Prefecture: Free admission for elementary and junior high school children every Saturday during the school term/200-yen-discount on admission for up to five persons upon presentation of the Guchoki Passport. Directions: By train: Take the Joetsu Shinkansen to Takasaki, change to the Joestu Line, and disembark at Shibukawa. From Shibukawa, ARC is 10 minutes away by taxi or 15 minutes by bus (take the Ikaho Onsen bus to ″Green Bokujo Mae″). By car: 8 kilometers (about 15 minutes) from the Kan-etsu Expressway Shibukawa Ikaho Interchange (in the direction of Ikaho Onsen).